Much like the original, GANG OF GHOSTS highlights the gluttony of the land-sharks to multiply their money, but, sadly, much is lost in translation. Reason being, Satish Kaushik is unable to retain the qualities that made the original film work. Sure, the cinematic sensibilities are different, but the film ought to keep you transfixed from commencement to conclusion. GANG OF GHOSTS is funny in parts and the zany moments do make you smile occasionally but, alas, the genuinely funny sequences are few and far between. On the whole, GANG OF GHOSTS offers laughs, but only in bits and spurts. It’s disheartening to watch a wonderful concept go awry! Gang of Ghosts is an exhausting and depressing experience. Depressing because this film could have been so much better.The second half is so excruciating that I actually contemplated walking out. What was the exact moment when I wanted to leave? That would be an item number during which one of the leading ladies declares: Mujhe aankhon ka apple bana lo, badi juicy hoon main Rajaji. Gang of Ghosts is another level of bad. I’m going with one star. The concept of a comedy about the life of ghosts is unique and it had the potential to be a laugh-riot but, unfortunately, the humour in this drama is not funny enough. In fact, the first half is very boring as characters get introduced one after the other. The drama in the second half is better and the pace also picks up but again, the film never turns into a laugh-riot which it was meant to be. On the whole, Gang Of Ghosts does not succeed in making the audience laugh too often or too much and will, therefore, not bring smiles on the faces of the people connected with the film. It will, in fact, entail heavy losses to all concerned. Clearly, makers like Kaushik, who had a formidable box office record in the ’90s remaking South Indian films, need to borrow modern-day technique and storytelling tactics to keep the ever-evolving viewer engaged. In the case of GOG, the only ones who seem to have had a blast are the actors.Ghosts and their hare-brained plan to bring the tycoon down to his knees is so amateur, that it fails to amuse. Satish Kaushik, normally a sensible director, succumbs to commercial pressure. He uses some really vulgar dialogues in an attempt at humour, adds in a completely annoying item number and some gimmicky VFX. The film could’ve have definitely been entertaining had the director paid more attention to the humour than the gimmicks and songs.Gang Of Ghosts has its moments, but they are far and few. But, if you really want some laughs, go with the original,Bhooter Bhabishyat. Gang Of Ghosts belongs to the category of bad remakes. These creatures are totally lost in translation and do not stand a chance in hell of salvaging this insipid official remake of the 2012 Bengali hit, Bhooter Bhabishyat (The Future of the Past). The filmmaker-protagonist of Gang of Ghosts refers to RGV’s weird camera angles and even suggests that he might get the director of Satya and Company to shoot the street killings in his proposed first film. It deserves a quick, unceremonious burial. Moral of the story: Never rake up ghosts of the past. Gang Of Ghosts is a remake of Bhooter Bhabishyat, one of the most acclaimed Bengali films in recent times. I haven’t seen this social satire, but I could immediately understand its contextual significance. Buried beneath the thick layers of Bollywoodisation, the original script manages to sporadically shine through. It crackles with self-referential humor—a parody about parodies of films within a contemporary film-with numerous tributes to regions and their idiosyncrasies. Of course, director Satish Kaushik refuses to quit when he is ahead, and injects it with a familiar loud brand of motley chaos. The paranormal beings in this one are just ghastly. If there are ghosts lurking around for real, then I fear they might take offence to such shoddy cinematic representation. It is buffoonery at its worst and a comedy that pretends to carry a social message. Their guns are trained on the greedy real estate magnates that dominate Mumbai. In their process of building skyscrapers, they have forgotten about the dead, the ghosts claim. At one point, Kher even rolls out a plea about graveyards getting smaller and the dead suffocating in their own coffins. If that didn’t kill you, then you may just survive Gang Of Ghosts. Ideally, there should have been a zero rating for the film because it is a scene by scene copy of the original and still it shocks me how did this one come off to be such a convoluted tale. 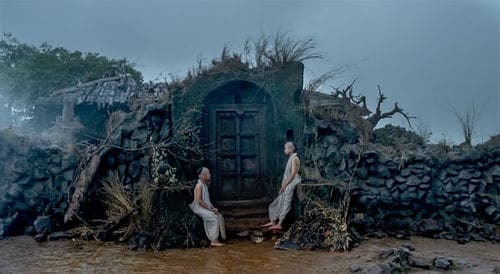 Contrived, messy and loud, the film is shamefully lousy defying the law of remakes that expects the infusion of some new perspective in a borrowed premise. If you at all want to watch a film, grab a copy of Bhooter Bhobishyot with sub-titles. Anyday a better tale!